PAPER SHREDDING for your HOME or OFFICE! 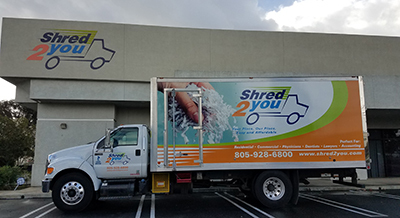 At Shred2You Inc, we provide top-rated on-site residential and business paper shredding to communities from Paso Robles to Carpinteria. We also accept appointments at our office location in Santa Maria. Your important and confidential documents require careful handling for proper disposal and we promise to provide that service to you. When providing on-location service, you can view the efficient paper shredding process so you can be assured that your documents are handled privately and conveniently! Save hundreds in Employee wages, Time, and Frustration.